If you are connected to the world of golf, you might have seen advertisements throughout the year for a new event called the Major Series of Putting (MSOP). 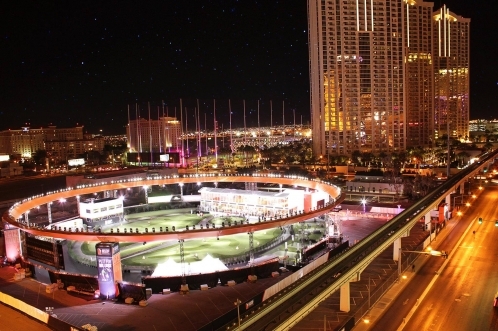 As a minigolfer I was a bit worried that an event like this, which had some series funding thanks to be founded by the creator of Cirque du Soleil, would overshadow what we were trying to do with the sport of minigolf especially the major events in the US. While I didn't get a chance to play this year, the miniature golf community was well represented with several individuals from the United States and Sweden competing in the various events. You can find our short wrap up on how there did here. After the event we had a chance to catch up with some of the individuals to get their thoughts on the MSOP as well as how it fits into the tapestry of the other major miniature golf tournaments around the world. From this editor's point of view it seems like it has a fit when compared to the other major MOS style tournaments. One could make the case that we also have a set of MOS "majors" now that all would feature different styles: 1) the World Adventure Golf Masters (WAGM) which features the use of minigolf balls and tends to have more open lanes, 2) the Putt-Putt National Championship with uses golf balls and is focused on a specific style of miniature golf course, 3) the USPMGA Master's which uses one defined golf ball and is played on two miniature golf courses and 4) the MSOP which is more lined up with golf course putting. Could we see someone who wins all of these events? For the complete interview, we reached out to Matt Male, a USPMGA Master's winner and member of the Team USA contingent who has played in the World Adventure Golf Masters (WAGM) and Gunnar Bengtsson, this year's overall winner of the WAGM and who has competed in the USPMGA Master's. Given the putting in the MSOP was adventure style, we thought it fit well with the Master's and WAGM experience. We also had a few questions for Ricard Lockner who also is a Master's winner and was the big winner of the high roller tournament at the MSOP, bringing home a cool $110,000 from that event. It's a lengthy interview, and has been edited for space, but we hope you enjoy this look into this new putting event. Minigolfnews (MN): How did you hear about the event and what drove you to enter? Gunnar Bengtsson (GB): I first heard about the MSOP back in the summer of 2016. Some of the US players at WAGM 2016 in Kosovo had heard about it and shared the news. At the time they planned to held the competition in October 2016 and the general consensus among players was that the schedule was overly optimistic and nothing would come of it. This proved prescient as the date was pushed to March 2017, and then finally October 2017. In June this year Anders Olsson called Ricard Lockner and me (we were playing the Czech Masters at the time) and said he was definitely going to play in the MSOP. That pushed Ricard and me to decide as well. Matt Male (MM): I knew about the event for a long time because of all the posts I'd seen about it online. As Brad Faxon told me, the late October/early November slot seems to be here to stay since it coincides with the Las Vegas PGA Tour event at TPC Summerlin, the Shriners Hospitals for Children Open. I've always liked putting on golf greens, so I thought this would be a great fit. I'm very glad I played. (MN): How did you choose what events to participate in? What ended up being your favorite event? (GB): It felt like the best way to maximize my chances was to participate in as many events as possible. Practice time on the course was limited and the players who played in most of the events did gain an advantage over those who just showed up for an event or two. My favorite event by far was the team event that I played with the great putt-putter Rainey Statum. After going it alone for all the other events it was great to partner up with someone and it was fun to switch between alternate shot and best ball. (MM): I was limited in terms of what I could play because of my remaining 2017 vacation time and the steep entry fees. Both Brian Johnson and I chose to prioritize the All Pro Championship. The $1,000 entry fee wasn't prohibitively large, and the chance to compete against PGA Tour players was too good to pass. (MN): What was the venue like? It looked amazing from the pictures. Did you see good crowds given its location? (MM): The venue was world-class, yet not excessive or ostentatious. As wonderful as it was in pictures, it was even better in person. It's also surrounded by lots of pretty sights on the strip. The beauty and contrast that golf course designers can create nowadays with the modern synthetic surfaces is remarkable. The course also reminded me a bit of Kosovo in 2016 in that it lent itself to beautiful aerial footage from drones. The indoor portion of the facility was immaculate. There was an impressive "orange carpet" entrance that led to the front desk and then bar and eatery that overlooked the golf action. At the outdoor portion, in addition to the 18 beautiful holes, there were also numerous skill games, a four-hole playoff course, a large practice green, and lockers for the players'. There was an indoor scoring tent for players after hole 18 that was comparable to what the PGA Tour uses, and the impressive live scoring screen was so vast that it could be seen from well beyond the property. The venue was especially pretty under the lights at night, and the weather seemed perfect all day every day. The crowds were fairly ample throughout the day, and everyone seemed very impressed. (GB): The venue was like nothing I�ve ever putted at. It looked beautiful, especially with the lights on at night. Shadows were a slight nuisance once the overhead lights were on, as each player cast long shadows in every direction. I liked the fact that the putting area was circular and raised, with walking zones all around and through the middle. That made it easy for spectators to get close to the action without disturbing the players. Crowds were fairly limited for most of the days. I�d say most spectators fell into one of a few categories - participants or friends/partners of participants, MSOP staff and organizers or sponsors. That said, there were a few people who dropped in off the strip to check it out. (MN): You played in the WAGM, Masters and MSOP this year - can you compare and contrast the experiences? Did it very based on the event you were in and the amount of money up for grabs? (MM): I loved all three events, and those three were my favorite tournaments of the year. I'd have to give the edge to the two American tournaments just because that's the game and equipment to which I'm more accustomed. Even though I ended up doing pretty well in Croatia (but not compared to Gunnar! ), I felt a bit uncomfortable since I had a lot to learn in a relatively small amount of time. As far as the Masters, I always go on and on about how much I love Myrtle Beach, and this year was no different. I made a comeback and had a chance to win entering the last round, but Tony Varnadore decided not to let anyone get too close. I was one of the few who really liked the new Rumble because of all the big numbers that could be had. This made it more of a mental grind and frustrated lots of players, which was fine with me. Finally, with Las Vegas, the money factor made the MSOP intense in a different kind of way, but I loved it. I would've loved to play one more round and get more practice. I only played 36 tournament holes and missed the top-16 cut by one stroke. I was happy to beat lots of professional golfers, but I didn't beat quite enough. It's nice to finish inside the top 20 in a field of 76 professionals, but I would've loved to do one stroke better to have a chance to win $15,000. Rainey was the only miniature golfer who made the cut in that event. However, the miniature golfers had very good performances throughout the week-plus in Las Vegas. (GB): Very contrasting experiences. If we start with WAGM, it�s the style of putting that I�m more comfortable with. I can use my minigolf putter and pick any WMF approved ball. This leaves players from outside Europe at a disadvantage as they�re not used to selecting and analyzing different balls. The organizers of WAGM, with Pasi Aho at the top, are second to none. Everything from groupings, to tee times, to practice times, is top notch. Result reporting on site and online is perfect and you can follow the tournament stroke by stroke. The US Masters is always a great experience socially, and the size of the field and amount of players who have a shot at the title in Myrtle Beach is unparalleled. I love playing here and always enjoy the laid back atmosphere. Unfortunately this event is dogged by a lack of attention to details when it comes to organization. Rules will change from one day to the next. Starting times change on a whim. Results are only posted on site after a long delay and there�s no online presence at all apart from the social media postings by participants themselves. The Hawaiian Rumble, where you play 7 out of the 12 rounds of the competition, was revamped this year. The rocks and new carpet made many of the holes very inconsistent. Random kicks. So this course played much worse than previous years. Going out of bounds results in a penalty stroke. That�s uncalled for since there are several holes where you can easily go out of bounds by missing by just an inch, or by hitting an uneven rock. To sum up the US Masters, it could be a great competition but unfortunately it�s not. The MSOP was a different animal all together. To start with, only a very small percentage of the participants were minigolfers. Most if not all were golfers. That set the tone for the event. If it hadn�t been for the money I know that I wouldn�t have played there, and I think that�s true for most participants. The organization behind the event seems to have very deep pockets. They literally spent millions of dollars on this two-week event, not counting prize money. The stadium they built, and the staff, and onsite reporting was amazingly professional. Play by play announcers during each event kept excitement levels up. One of the few negatives about the MSOP was the lack of practice time and poor communication of this ahead of the event. We arrived three days before the first competition in the hopes of getting some practice time in but couldn�t even get into the arena until the morning of the first event. Ricard Lockner (RL): This was by far the best putting event I have ever played. Everything was so professionally done, the staff, the course, the referees, the media coverage, even the restaurant. I don�t think you can do it much better than they did. (MN): It seemed like all the various "types" of putters (PGA pros, minigolfers, regular dudes) all seemed to get along. Was there a feeling out process as the different camps got to know each other or did it just happen naturally? (GB): I�d say most people I ran into were very surprised that there were minigolfers at the event at all and that such a thing as competitive minigolf exists. I spent quite a lot of time trying to explain to people what minigolf is, and how it�s played in Europe and throughout the world. As minigolfers continued to do well interest kind of grew though, and I know that Brad Faxon in particular was fascinated with how well we performed compared to PGA players. (MM): It seemed to happen naturally. John Cook, a two-time major runner-up, somehow instantly seemed to click with me, maybe because he and I are both Columbus natives, which he liked. John and I cheered for each other, and we ended up tying. Brad Faxon may have been the one person outside of Brian Johnson with whom I spent the most time during my trip. Brad went out of his way to show interest in miniature golf and seemed genuinely interested in the sport. He must have asked Brian and me about 15 questions, which Brian and I were happy to try to answer. Colt Knost also wanted to know more and expressed interest in maybe playing a miniature golf major next year. It was fun to "geek out" with them about putting matters such as "left-hand low," "release," and swing thoughts. I know Brad must get questions about putting all the time, but he seemed genuinely happy to answer anything. I was blown away by their level of kindness and their respect for miniature golf. I also became friends with a couple Canadian pro golfers whose games (and personalities) were very solid. (MN): Do you think the MSOP will have legs in terms of being a long term event? How do we go about getting MSOP participants interested in minigolf events and vice versa so we're not all competing for the same spotlight? (MM): Yes, I think the MSOP as a product has potentially vast upside because it may capitalize on what could be a very exploitable golf metric: a putting-only venue on a large putting green with no obstacles. Miniature golf is great, but it hasn't seemed to draw much of a golfer audience. The MSOP concept could potentially attract lots of regular golfers, particularly younger people who may not be as wealthy or willing to spend five hours playing one round of regular golf. It also incorporates so much of the cutting-edge technology that young people love. I'm extremely excited about this concept. As far as working together and not competing for the same spotlight, I think it makes sense for miniature golfers to give this a serious try. Of the dozens of people to whom I spoke, none regretted making the trip. They raved about it just as I did. Give it a shot and see if you like the test. It's a little different, and green reading is a bit more of a factor, but hitting the ball on the intended line with the proper pace is still the name of the game. If lots of miniature golfers play in future MSOP competitions and tell the golfers about miniature golf, word of mouth could help miniature golf. If the MSOP really takes off, maybe miniature golf could look at some of the strategies of the MSOP and try to implement some changes, particularly in trying to attract younger players through marketing and new technology. The professional golfers are very good putters, but so are professional miniature golfers. It's obvious that the professional miniature golfers "held their own" throughout the entire MSOP. I think we're better putters than many PGA Tour players, although not necessarily when it comes to the elite, upper-level current and former PGA Tour putters (Knost and Faxon, for instance). I think our game's best putters would have close battles with elite PGA Tour putters such as Knost and Faxon. (GB): I do believe that the MSOP will return next year, with an even bigger prize pool, more qualifiers and more participants than in 2017. Most of the players I spoke to this year plan to return in 2018, and many who didn�t participate now will try to qualify next year. But I don�t think it�s really about getting MSOP participants interested in minigolf events - I believe the MSOP might be the future of the sport. If we keep seeing minigolfers performing well in these high-profile events, interest is going to spill over to the sport and the players. This is about growing the pie by creating something new, and the golf/PGA pie is about a thousand times the size of the minigolf pie. (MN): I scrolled the leaderboards and saw very few female names. Was that the case? I know it's an issue in many of our events as well (especially in the US) - do we think this event has a better/worse/same chance of increasing diversity and why? (GB): It�s true that there weren�t many ladies in the MSOP, but I�d say there were more than at the US Masters. The UNLV golf team had an unpublished event one of the days where their ladies team met the men�s team. The ladies did about as well as the men and really seemed to enjoy it. Since the MSOP is targeted at golfers, and there are many very talented putters on the LPGA tour, I believe it could have a good chance of attracting top level ladies and increase diversity. I think many lady golfers would love the chance to compete against men on a level playing field. (MM): There weren't many females, but there were a few. I think the MSOP correctly tries to market itself by selling putting as a skill that is a "great equalizer.� The more this is stressed and the more people talk about the excitement surrounding this event, I think the more men and women alike will be interested. I'm very optimistic about the potential of the MSOP. The MSOP team seems very serious about growing, and all the MSOP people seem very willing to listen to feedback. We should try to consult with them and help them create more opportunities to play the sport we love. (MN): Ricard - it looked like you played well the rest of the week. Did you go into the final big money event with the top spot in your sights or were you just looking to do well? (RL): I cannot say that I was playing well the rest of the week. I did not get enough aces and made one or two mistakes too many. When it is so close as it was on that course and so many good players every mistake will cost you a lot. I had mostly rounds around 34-35 and if I had 33-32 I would have been inside top-10 almost every time but [you need to be on your game] against players like Anders Olsson, Gunnar Bengtson, Rainey Statum from the miniaturegolf world nd pro golfers like Taylor Montgomery, Chris Johnson, Jacob Stasiulewicz, Jeff Gibralter, Cole Nygren, Colt Knost and many more. The last tournament was match-play and anything can happen in match-play. You go out and play smart, put as much pressure as you can on your opponent, try to get them to make the mistakes and see what happens. I always try do go as far as I can in a tournament because if you don�t try you will never succeed. This time it worked very well for me. But it was a very frustrating week up to that point I know what I am capable of when I get it together. (MN): At what point during that final event did you think you had a shot at winning it all? Can you walk us through what the last moments were like? Many of us have had the chance to win money at events but nothing this big - did the dollars creep into your mind as the round wound down? (RL): Probably when I aced two of the harder holes on the course (14 and 16) against Jacob Stasiulewicz in the semifinals. Prior to that match Mr. Stas had taken out both Gunnar and Anders so he almost got the nickname "The Swedish Killer". When I was able to make 14 and 16 it got to be a little too much for Stas so I won the match 3/2. My matches where against Josh Beckett (Hall of fame Baseball player) 1/0 Daniel Negreanu (Poker pro everyone in the poker world knows Kid poker) 5/3 Jacob Stasiulewicz (Golf pro) 3/2 Jeff Gibralter (Poker pro and once played on the PGA-tour) 1/0. Against Mr. Gibralter in the final I was 2 up with 4 holes left. Hole 15 was probably the easiest hole on the course and Jeff aced it so I needed an ace to hold my 2 hole lead. The last days of the tournaments it had started to get really windy and the gusts easily moved the balls of the line, so you had to be very patient and try to hit the ball between the gusts. I lined up the ball and waited for the wind to die down�and I hit a bad putt so I missed the ace now I am 1 up. My mind goes to hole 17 straight away as 16 is just about making no mistakes and we split 16 to keep me 1 up. So I am a little angry on the inside because I gave Jeff the chance to win. The only thing left to do at that point was to ace 18 and it�s the only thing in my head. I knew exactly what I need to do and I was not going to leave this putt short. I lined the ball up and hit a nice putt perfect speed and it went in. Jeff had still the chance to keep the match going if he made 18 and he hit a good put but it lipped out on the left edge of the cup. That was unreal. Brad Faxon asked me after the round how my mindset was on 18 and I told him the same thing as you. The only thing in my mind was to get that ace on 18! Editor's Note: Thank you to Gunnar, Matt and Ricard for doing this interview. Their insight was great and we hope to see a lot more minigolfers at the event next year. European Seniors Champion Markus Janssen.